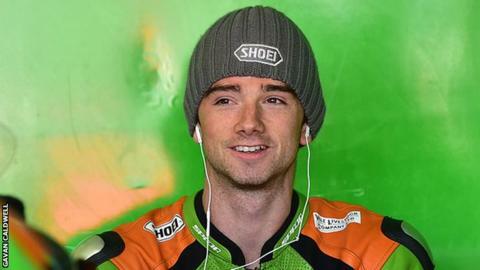 British Supersport rider Glenn Irwin will make his road racing debut at the Ulster Grand Prix next month. The 24-year-old from Carrickfergus will compete in the Supertwins class, replacing the injured Jamie Hamilton on the VRS Racing machine at Dundrod. "I've always been interested in road racing and I've been wanting to have a go now for a few years," said Irwin. "I have never even ridden a bike on the road and it will be very different to the short circuits." He added: "I think now is a good time for me to start, especially in the Supertwins class, as it's slightly slower than the bigger bikes but still really competitive. "You have to have your wits about you, but I'm excited to give it a go." His father Alan was a successful road racer and is passing his knowledge on to his son. "We've been round the track in the car a few times and hopefully I'll be able to follow in his footsteps," said Iwrin, who lies fifth in the British Supersport standings. "It's hard to say how things will go in your first road race but I think that if you start with the right attitude and do your homework there's no reason a short circuit rider like me can't be successful on the roads."